This page contains our Welsh Language Scheme. We have adopted the principle that in the conduct of our business in Wales we will treat the Welsh and English languages on an equal basis. Our Welsh Language Scheme explains how we provide services to patients and members of the public who are Welsh speakers. Our scheme was approved by the Welsh Language Board on 12 July 2011, following a public consultation. We monitor the scheme’s implementation and report annually on progress in implementing the scheme to the GOsC Council and to the Welsh Language Commissioner. The latest report covers 2017-2018. If you are unhappy about how we perform the services we provide under our Welsh Language Scheme, you can make a complaint to us. 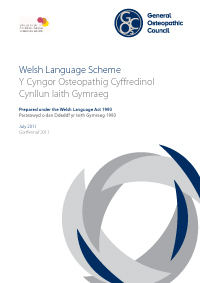 Our Welsh Language Scheme complaints procedure explains how to do that. We welcome feedback on the scheme at any time and you can send us comments using the Contact us form on this website or by emailing welshlanguage@osteopathy.org.uk.